In the majority of glass plant installations, vessels find universal application as Stirring vessels, reboilers, receivers and separators as well as for storage, feed or measuring. This section of the catalogue describes a wide range of both glass and non-glass vessels together with the items which are normally used in conjunction with them such as vessel covers and stirrers. Standard glass vessels are available in two basic forms: spherical (available up to 200 litres in capacity) and cylindrical (available up to 200 litres in capacity). Large spherical vessels are not available but cylindrical vessels with higher capacity than 200 litres can be supplied to special orders. All glass vessels have standard flat buttress end connections. Further details of these are provided in section Technical Information. When spherical vessels are used as Stirring vessels or reboilers, the top branch in generally used for the column or stirrer. The side branches on standard vessels are generally DN 25, DN 40 or DN 100; DN 25 and DN 40 being at 10° to the vertical (45° on type VSU) and DN 100 being at 45°. The only exception to this are type VSD spherical vessels which have DN 50, DN 80 and DN 150 side branches at 90° to the vertical and are used mainly in boiler circulatory systems. The smaller branches are normally used for such components as thermometer pockets, resistance thermometer and feed pipes. The DN 100 branches are normally used for charging solids or for the connection of vapour pipes when the top branch is used for a stirrer. In application where temperature control is necessary, heating bath and mantles are available and detailed in this section. 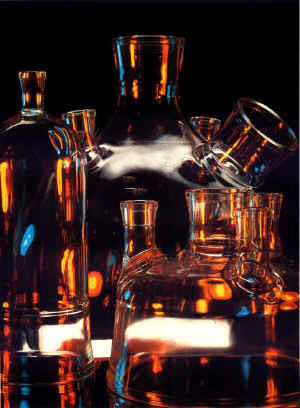 In addition, some glass vessels are available with jacket for close temperature control. If spherical or cylindrical vessels are used in conjunction with a heating mantle or bath, a longer bottom outlet is required and should be specified when ordering. The VSL spherical vessels are specifically designed for this purpose. The majority of vessels have DN 40 bottom outlet. For application where it is necessary to avoid the build-up of solids in this outlet, the vessel can be fitted with a bottom outlet valve. (See section – Valves & Filters). This should be specified when ordering. The type RFC valve is an ideal alternative for vessels, which do not have a sealed-in valve seat. By combining vessels with stirrers and stirrer drives, an extremely wide range of agitated Stirring equipment options is possible. This fact is enhanced by the inclusion of PTFE Stirrers as well as their glass counterparts, thus allowing further options to be considered in the process design. Vessel/stirrer compatibility tables are detailed in individual stirrer description. Both spherical & cylindrical vessels can be supplied with graduations to special order. Standard graduated cylindrical vessels are shown in this section. For standard flat buttress end connections from DN25 to DN150, it is possible to achieve a 3° deflection in the joint by using a flexible gasket. Details of these and all other couplings and gasket can be found in section Couplings. Unless otherwise stated, all dimensions are given in mm. All vessel capacities are given in liters. For permissible operating conditions, unless otherwise stated in the individual description, please see section Technical Information.